Moon Games launched the middle of 2013 and hosts features that are not available anywhere else. The games are packed with dials, bells, buttons like the exclusive bonus wheel game, a gift shop and a reward booster which guarantees you a win. You can collect loyalty stars then trade them in for vouchers, jewellery and electronics – providing you have enough starts to trade. Moon Games features a handy section called “My Games” that shows you your most played and favourite games. 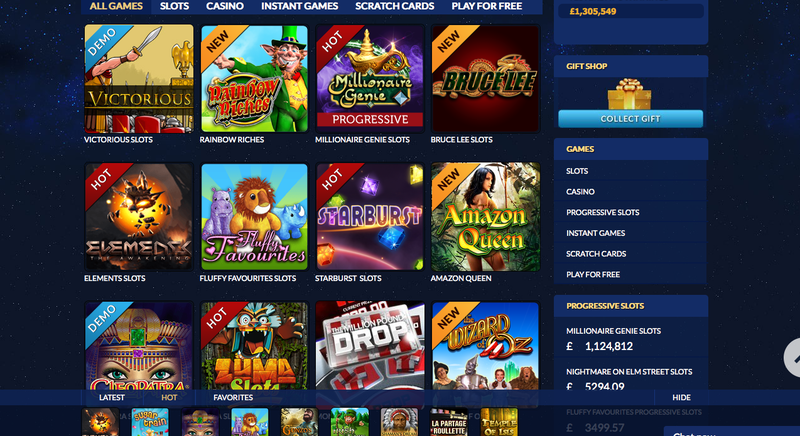 A few of the many slots available are Fluffy Favourites, Irish Luck and Shaman’s Dream. All games can be played in Demo mode so you get a practice before playing for real cash. Moon Games is available to play on the go via a smartphone or tablet, but you’ll need a good Wifi connection in order to play. Check out the Ground Control feature that allows you to control your cash and play responsibly. This is a cosmic casino that will appeal to Sci-fi lovers. Over 200 titles available to play instantly, titles include: Atlantic Blackjack, Captain Keno and Irish Luck. This site is different to the rest, almost out of this world in terms of difference. A very attractive site that appeals to both male and female players. The graphics are top quality and the site is very welcoming. Your details are safe and secure whilst playing at Moon Games. Moon Games is licensed and based in Gibraltar. Paypal, Paysafecard, Neteller, Mastercard, Maestro, Visa, Visa Electron, Ukash, Delta and Entropay are accepted here.